Hours: Sun-Sat 7:30 a.m. to 9:00 p.m. I hope you are seated as you read this next sentence. 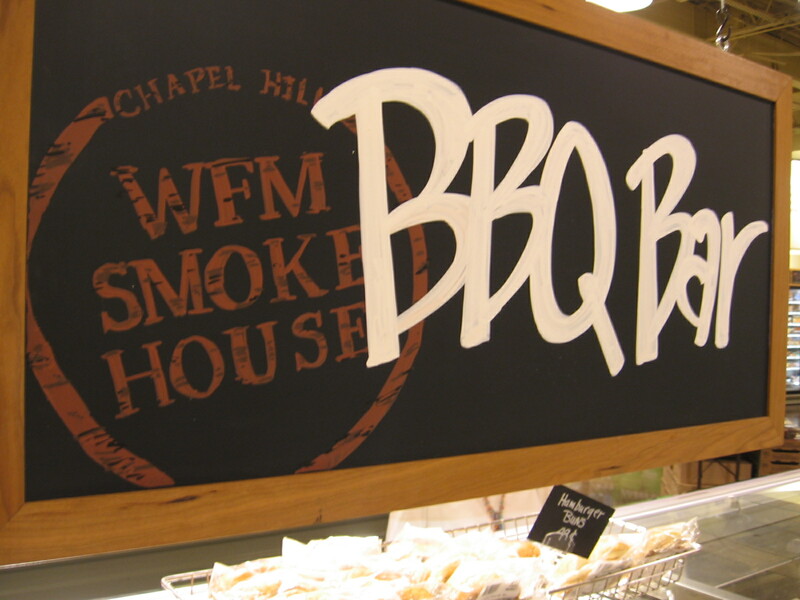 Whole Foods serves its own, house-cooked barbecue. And I actually worked up the nerve to try it. I know, I know, eating barbecue at Whole Foods seems about as wise as a barbecue joint offering tofu on its menu. But I am an intrepid soul when it comes to barbecue and I’ll do nearly anything for the sake of a blog post. Plus, Whole Foods is based in Austin, Texas, which even this Carolina boy admits is pretty serious barbecue country. It pains me to admit this, but the NC-style pork barbecue at Whole Foods was not bad. Not real good and certainly not great but okay, adequate, passable, just fine, thank you. I was expecting a gussied up dish that bore little resemblance to real NC BBQ but the pork was rough chopped to a nice consistency, moist despite being on a steam table, and served with a simple Eastern-style vinegar and spices sauce. The pork even contained some outside brown meat, firmer and more flavorful than the rest. Most importantly, the barbecue contained no unwanted additions: no chunks of organic kumquat fruit, no sauce made with locally-raised fig compote, and no free-range kale juice used as seasoning. Whole Foods BBQ at the Raleigh Ridgewood Shopping Center has run from the self righteously-awful-beyond-belief to possibly adequate with the addition of enough hot sauce. The main problem with Whole Paycheck is its holier than thou attitude towards natives who did not grow up eating bagels. Now, I realize you’re just poking fun at our BBQ, but a C MINUS??? I would give it a solid B. No, we don’t produce excellent BBQ, but I’ve honestly had worse from dedicated ‘Q joints around the state. Please tell us exactly what you didn’t like. If the flavor was missing, let us know. The cooker is gas-assisted, but we cook with real hardwood logs, no pellets, no briquettes. Did you not like the decor? Details, please! WF Team Member, please don’t take offense to the C- grade. I am an old school grade giver. C is average in my book and the WF BBQ I had was just a little below average. I have definitely had worse in BBQ restaurants but I have definitely had better too. I just had some at the North Raleigh Whole Foods and I liked it. Heavy on the vinegar and pepper and, I think, light on the fat. So, it could be a tad healthier than my usual ‘cue. Not to be confused with the Skylight Inn though…. I just had cue @WF/Ridgewood. Can’t remember the variety (flavors & spices with which it was cooked) but it was one I hadn’t seen there before. Great blend of flavors, that do not overpower the pork. The pork taste shines right through. Didn’t taste oversalted either, which I think keeps it tasting fresh and not over-processed. The only thing I wasn’t crazy about is the obvious bits of fat. I guess that may go with its authenticity, though. 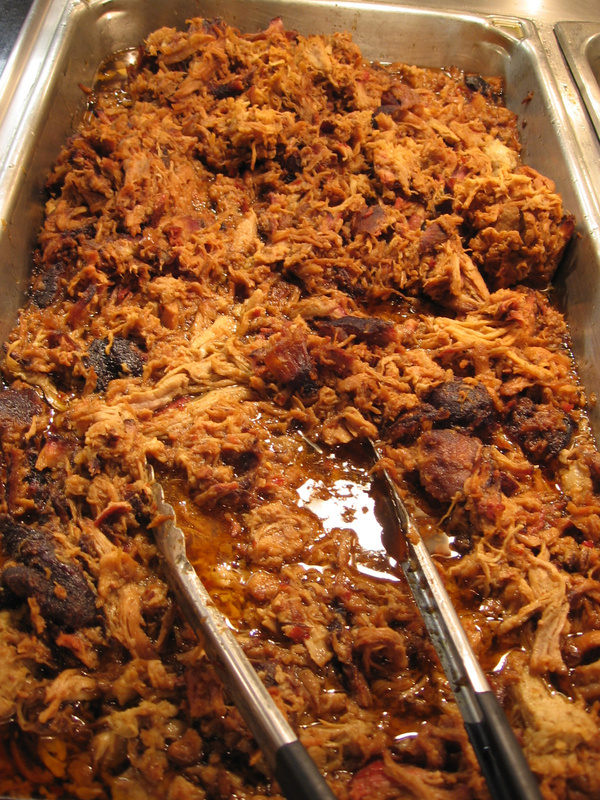 PS – Fwiw, I grew up in the barbecue capital of the world, Shelby, NC! I know it’s western NC style there and eastern NC style here in Raleigh. Like both, but never care to have tomatoes in my BBQ sauce. Now the slaw, that’s a different thing!